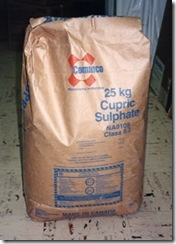 I was alerted about a discussion on a blog forum concerning if the use of copper sulfate mordant was a good alternative to nitric acid. 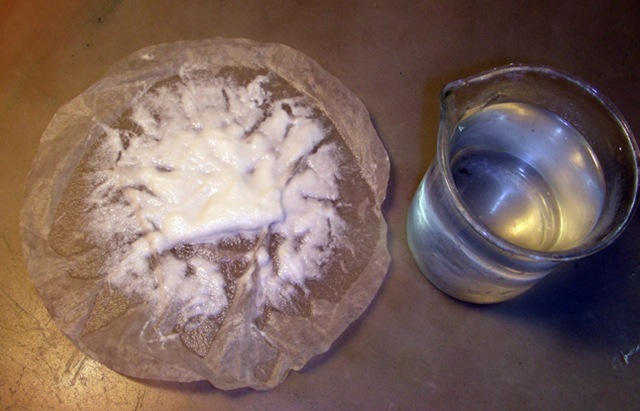 As I read the comments, I realized that was much confusion on the chemistry of using this safer mordant because either some had not studied thoroughly the articles available on websites to better understand how it works – or just listened to some ones’ incorrect opinion . Once during a discussion with an instructor of printmaking, he said from his experience, artists seem not to read instruction manuals or much about techniques. From teaching workshops, I have to agree with his observations. 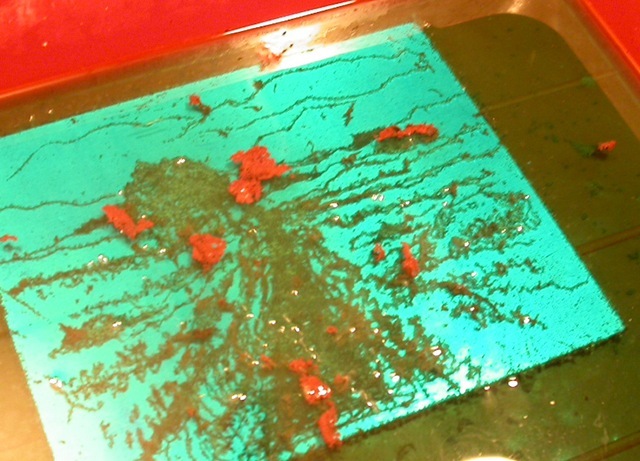 First of all we have to consider is that there are no none toxic printmaking method; just safer ones. Now just think about nitric and Dutch mordant —– and compare. So a simple chemistry lesson 101. Let’s compare the MSDS information on ferric chloride and copper sulfate or chloride for toxicity. There are four major factors to consider: Health, Flammability, Reactivity and Contact with ratings from 1 to 4. For Ferric chloride health, reactivity and contact are listed, with health and reactivity at 2 (moderate) and contact at 3, which is considered severe (corrosive). For copper compounds only health and contact are the ones with any concern; rated at 2, which makes them moderate in danger to us. Back around the 12th Century, the Muslims discovered that mixing sulfuric acid and common salt produced a much stronger acid we now call hydrochloric or Muriatic acids – and byproduct sodium sulfate. 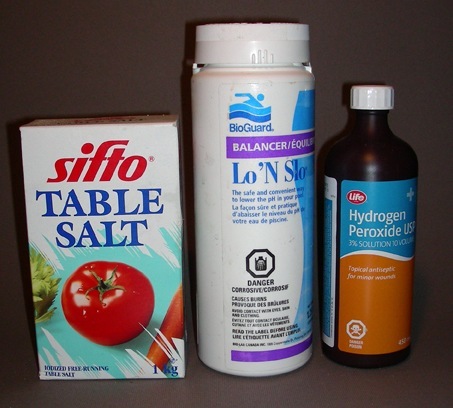 When I developed my copper sulfate etch in 1992, I realized that mixing sodium bisulfate into the bath to keep aluminium hydroxide from forming, was actually making a weak hydrochloric acid that produced hydrogen in reaction with the metal, which gently lifted the pure copper particles out of the etched lines. By using just enough of the weaker sulfurous acid to make very weak hydrochloric acid, its’ etching reaction was over shadowed by the electro-chemical action that removed most of the metal; making a mordant much safer to handle. With enough salt and the weak sulfurous acid, the bath would regenerate overtime, dissolving the fine particles of pure copper left from the electro-chemical exchange. I now realize that the new bath being formed actually consists of cupric chloride that could have etched copper plates, if it had been made stronger. What are the other advantages to using copper compounds? Well to start with the dry crystals are much cheaper to purchase and safer to store than concentrated liquid acids. 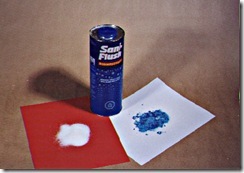 I realize there is a problem of handling the dry material because of the possibility of inhaling the fine dust, but I got away from this by mixing some salt with the copper sulfate in a large plastic contain so that when the salt absorbed a bit of humidity from the air, the dust problem was eliminated. A well fitting dust mask made it safer to transfer the crystals into the larger container. This was the powdered mixture used to make up a new bath if one was needed. I realize that this damp condition could produce a solid block over a long period, but it was used up fast enough that this was never a problem. As a bath, the light green color would allow the image to be observed all the time and the intensity of the color was an indication on the strength of the bath at the time. Another advantage over ferric chloride, was the etching area was not rusty colored, which is said to be very hard to remove. I understand that those who use it, pour the bath back into bottles after an etching session. At the university we keep a large tray always filled with the copper compound, but with a acrylic cover to reduce evaporation as the area was right next to the etching exhaust system intakes. One of the issues raised was the contamination of sewer system from the copper salts put down the drain. This is unnecessary if care is taken. There are procedures that can eliminate all the copper and zinc compounds before the spent bath is filtered, diluted and flushed away. When etching aluminium I would suggest the best way to remove all of the copper is to use scrap pieces of the metal to completely make the bath clear to show the removal of every molecule of copper from the solution. The solution is then filtered through a cloth to remove the copper particles, leaving only salt, sodium sulfate, sodium bisulfate and aluminium hydroxide. None of these cause problems in sewer systems, but check with your local authorities about this. If there is a problem, the aluminium hydroxide can be removed from the clear solution by adding some alkaline product such as borax, sodium carbonate or metasilicate. 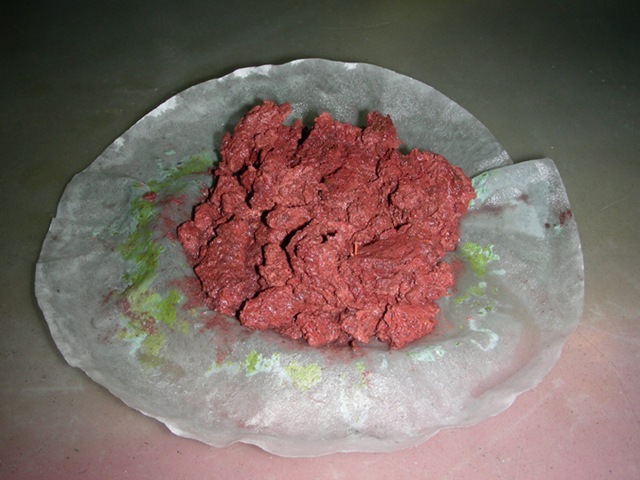 This will precipitate the aluminium hydroxide into a sludge as the solution loses its acidity, which can also be filter out through a cloth andÂ disposed as dry garbage. 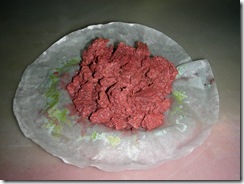 You should notice that I used synthetic dish cloths as filters that are easier to reclaim. A finer mesh cloth would have removed all the white material as a slight amount has been able for get through. Enough alkaline solution has to be added to get the pH very close to 7 or a bit higher to make sure all the metal has been captured. Copper particles filtered from the solution through a coffee filter. These paper filter are dense enough to prevent any fine particles getting through, making the clear solution free of copper. This method works for both metals. 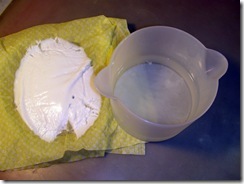 Aluminium hydroxide is being filtered out through double layer of synthetic dishcloth material. Aluminium hydroxide that can be dried and disposed of in dry garbage container. 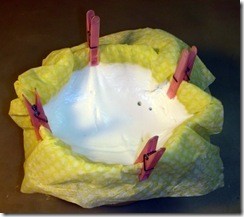 Note the small amount of material that has been able to get through the synthetic fabric. A fine material would prevent this. This small quantity of aluminium compound would not harm the sewer system as aluminium is present in alum, used to make pickles. If you are etching zinc, then the zinc chloride in solution is harder to precipitate but it has to be removed before disposal down the drains. I have found that the same procedure to remove solids work well. Filter out the solid copper particles after dissolving scrap zinc to remove the copper from the spent bath. As long as the solution is clear, there are no copper compounds in solution. I have found that adding sodium metasilicate is the best way to produced a white insoluble compound (zinc silicate) that can be filtered in the same way. If one uses the more acidic cupric chloride mordant for copper plates, there is no need for this procedure as the bath regenerates if enough oxygen is present. When you need to completely replace the bath and have to dispose of it, the same procedure can take place, but because of the lower pH and higher specific gravity, more alkaline material will be required. I have no idea on the life of a bath, but those who have used my updated original mordant, have noticed a white sediment at the bottom of the container. I have not had it checked at the chemistry department, but I suspect it could be some combination of sodium sulfate and aluminium hydroxide in our case, as aluminium is the metal of choice. This is very confusing for me as both of these compounds are soluble in water at a low pH. These are the safe common material available locally to make an effective mordant for all the common metals used for etching. The peroxide is needed only to make the cupric chloride bath recyclable. Â· Used in many cities to prevent the roots of trees plugging sewer lines. Some etchers are buying this ready made compound containing copper sulfate to etch plates using this process. Â· A product to add to swimming pools to keep down algae contains copper sulfate. Â· Dutch Elm Disease is prevented by using copper sulfate as a pesticide. Â· Algae control in fish aquaculture ponds. Â· Bordeaux mixture to manage fire blight on grape vines and other fruit trees. Considering the amount of copper sulfate used in these commercial products, the small amount that might get by through your bad recycling techniques, it certainly is safer for the etcher than using really dangerous acids in the studio. Yes, every little bit we keep out of the environment is a good move, that is why you can use the above technique to do your part and feel better and safer at the same time. I am just as concerned about our environment as you are; certainly more than most, but I also realize by being very careful in the techniques I have disclosed, no copper or zinc compounds should reach the drain. It doesn’t take that much more time to remove and dispose of the metal compounds in the safe way I have described. If you got this far, then I must compliment you on your interest and attention span. Previous Entry: Printing by Offset Using a Palm Press, Ozuka’s Baren or Even a Bottle. I use Microsofts’ Window Live Writer to assemble the text and pictures for publishing on the blog. While there are many good features for this free piece of software, it is very hard to do layouts like one can in Adobe InDesign or other like programs. It is just not that flexible. On previous articles I have found the uploads not holding the layout that I finished with, but on this one the area showing the filtration of solutions is totally out of whack. Sorry about that, but the information is there so look at the italic text as captions for the pictures. If you have any questions, get back with comments so all readers can participate in the discussion. 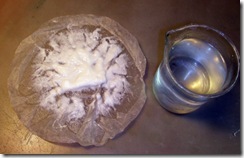 I forgot to add a better material to remove the zinc chloride from the spent solution when I posted it. I believe that using sodium silicate might be better to use to precipitate the zinc compound than the sodium metasilicate material. This silicate is also called “Waterglass” and can be purchased at potters supply, who add it to clay for its’ characteristics, so might be easier to find than sodium metasilicate in a pure enough form. Waterglass comes as a very viscous fluid that has to be greatly diluted before adding to the solution to remove the zinc as insoluble zinc silicate. Because it is not water soluble after drying, take care where you leave the spilled solution to dry. I love your blog and am fascinated by this new cooper sulfate mordant. 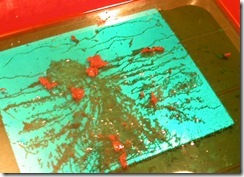 I have tried the electro-etch with mixed results. I only had a small power supply and the etching became a bottle neck for my students. So, in reading that you had come up with a formula to create a mordant with copper sulfate, Sodium Bisulfate and salt I was excited. 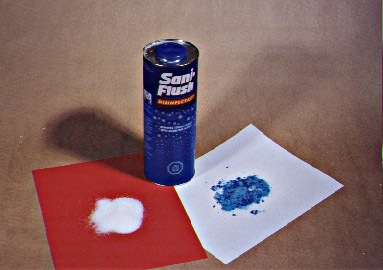 However, Sani-Flush has been removed from the market. Is there another “over the counter” product I can use in its place?